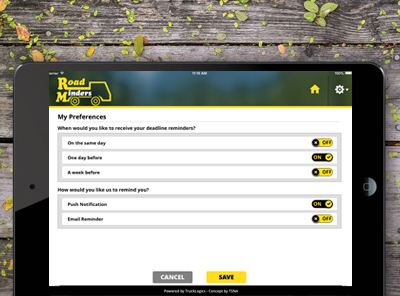 Unlimited ReMinders from RoadMinders - Anywhere, Anytime, Any Device. Absolutely Free. By helping you stay on top of personal and transportation-related deadlines, including quarterly & annual tax filings, license & permit renewals, and much, much more, RoadMinders makes sure that you can stay on the road without falling behind. Why is RoadMinders important for truckers? 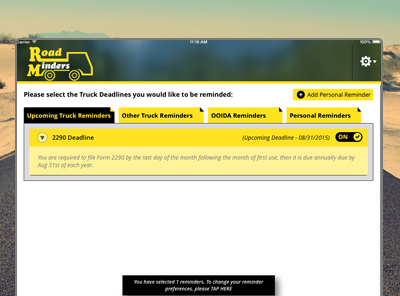 Set reminders for all truck deadlines that apply to your business. It's as easy as one swipe. Customize the type and frequency of your reminders. Add personal reminders for your vehicle maintenance, invoice due dates, or anything else you need to remember. Getting started with RoadMinders is easy! With no login to create, you have one less thing to remember. Simply enter in your email address, and you've created an account. Once you're in our system, set up your account information and you're good to go. The best part? It's free! RoadMinders helps you streamline your business by providing you with a plethora of alert options for every occasion. Whether you manage a fleet, operate on your own authority, or drive for a company, RoadMinders has the deadlines you need to remember to keep your life going. Customizing your reMinders is as easy as one swipe. Just turn on the reminders that apply to your operation and turn off the ones that don't. It's that easy! RoadMinders lets you customize the type and frequency of reMinders. Choose from email, text, or push notifications to remind you of upcoming deadlines. Or choose all three, so you never miss a deadline! After you decide what type of notification you need, it's time to decide when you'd like to be reminded. 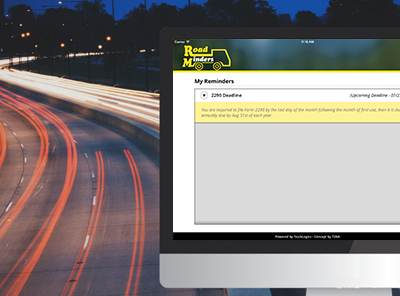 RoadMinders can notify you a week, a day, or an hour before an important deadline. With RoadMinders, you'll never file late again! After saving your reMinder preferences, you can edit them anytime if your needs change. No matter how large or small the changes, RoadMinders changes with you. Just log back into your account to update your deadlines, personal reMinders, or type & frequency of notifications. Leave late filing fees in the dust with RoadMinders! Get the most out of RoadMinders by adding personal reminders for things like truck maintenance, bills, doctor's appointments, and anything else you could think of! Get all the announcements for events and tips straight to your phone without having to worry about missing a thing. 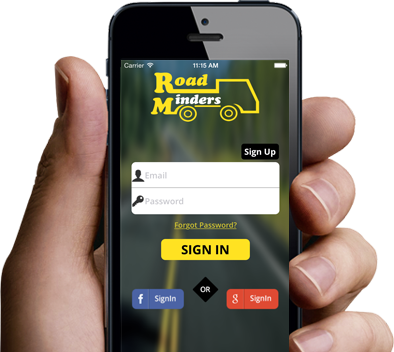 Download the RoadMinders app today! 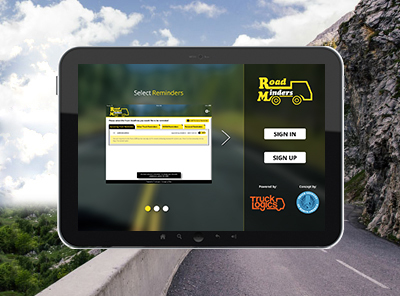 Once you download the RoadMinders app, you'll never have to miss an important deadline again. Wherever you are, whatever you're doing, RoadMinders makes sure that you remember what's important.